Advantages: Adds amazing detail and improved strength to the vulnerable chain gun hanging under the nose of the menacing Hind D and Es. 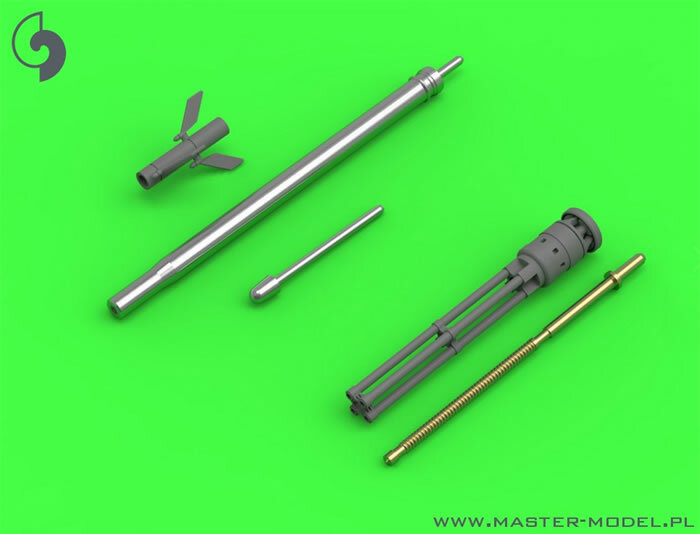 Conclusion: Master offers great products to enhance modelling across most genres and these helicopter gun detail sets are certainly amazingly detailed for items so small. 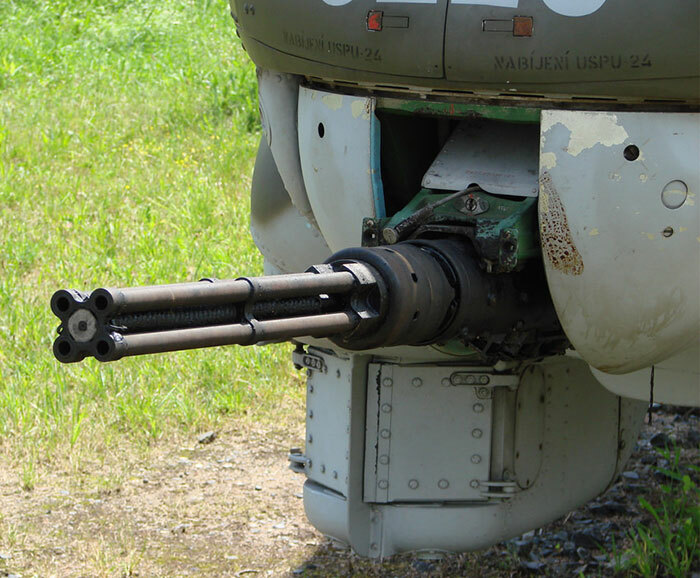 The Yakushev-Borzov YakB-12.7 mm is a remotely controlled 12.7×108mm calibre four-barrel rotary cannon developed by the Soviet Union in 1973 for the Mil Mi-24 attack gunship and low-capacity troop transporter, with 1470 rounds, which can also be mounted in GUV-8700 machine-gun pods with 750 rounds. It has a high rate of fire (4–5,000 rounds per minute) and is also one of the few self-powered guns of the Gatling type (i.e. it is gas-operated, rather than requiring an external motor to operate). On the Mi-24 it is mounted in the VSPU-24 undernose turret, with an azimuth of 60° to either side, an elevation of 20°, and a depression of 60°. The gun is slaved to the KPS-53AV undernose sighting system with a reflector sight in the front cockpit. It was replaced by the fixed, side-mounted GSh-30K or the swivel-mounted GSh-23L in the late mark of the Mi-24 helicopters, as it did not provide enough firepower against dug-in or lightly armoured targets that did not necessitate a rocket attack but it's still used on Mil Mi-24, Mil Mi-36 and Mil Mi-40 helicopters. 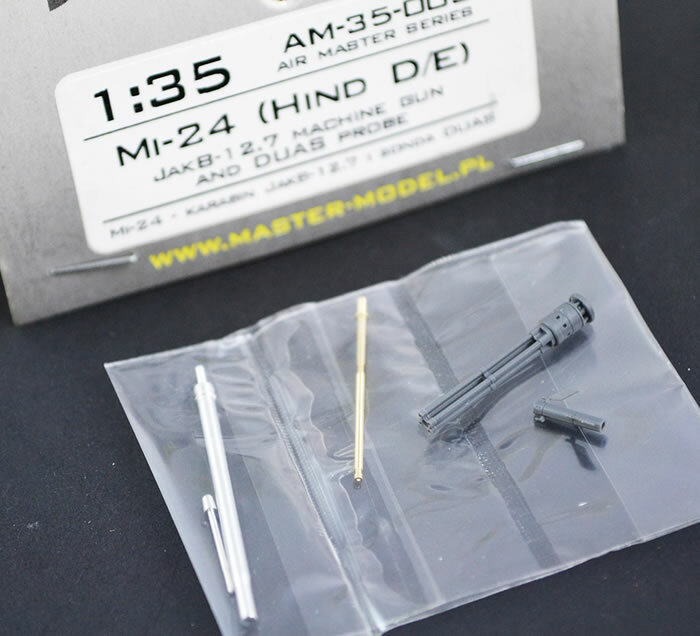 The Master Mi-24 Hind D/E sets are all made up of identical scale parts to create a very detailed and realistic rotary gun for the Hind’s chin. Not only do these sets give us great detail but the nature of the turned brass parts gives this structure strength. These sets are each made up of 3 turned brass parts and 2 resin pieces. The rotary gun consists of 1 brass part that being the centre rotational spindle, and the resin 4 barrel main body with lovely detail which is much finer than the injected plastic parts.. A good paint job will see this look particularly accurate. 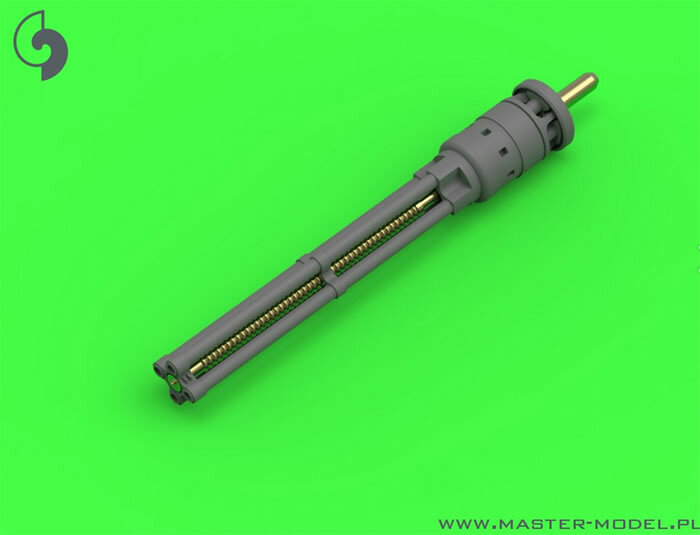 There is a 3 piece DUAS probe with turned aluminium main section. A very fine and delicate resin cast probe section supplied which requires no clean up at all luckily as I could see myself breaking it if clean-up was needed. Another fine turned aluminium section which is the nose section of the probe. 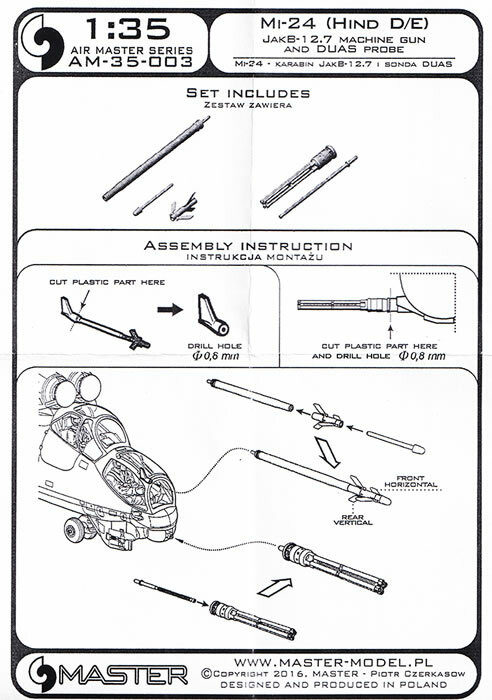 All parts are packed carefully with the more delicate parts taped within small foam inserts. In the various scales these sets cover a huge range of brands of kits. The 1/35 set is suitable for the Trumpeter kit. The 1/48 set covers Monogram, Mini Hobby Models, Revell and Trumpeter kits whilst the 1/72 offering is suitable for the Hasegawa, Hobby Boss, Italeri, Matchbox, Monogram, Revell and Tamiya kits. Each of these sets would be highly recommended to any Mi-24 Hind modellers out there. Keep them coming Master!